The biennial Jameel Prize is an international award for contemporary artists and designers who take inspiration from Islamic tradition, and the Victoria & Albert Museum is hosting the third showcase of shortlisted entries, including this session’s winning work, a collection of garments by Turkish fashion design label Dice Kayek, called Istanbul Contrast. The designers behind Dice Kayek, sisters Ece and Ayşe Ege, have created a striking collection that serves in many ways as a perfect symbol for the Jameel Prize concept. The exaggerated, domed skirts and shoulders are based on the classic architecture of Istanbul, and luxurious glass beading and embroidery suggest a link to the Byzantine past, but the clothes are also definitively modern and exciting. The Ege sisters have created designs that refer back to history and tradition while still seeming contemporary and even forward-thinking. The adaptation of textile traditions features heavily among the finalists’ work. The beautiful, complex textiles of designer Rahul Jain, who uses time-honoured silk and precious metal weaving techniques, are largely in keeping with conventional aesthetics, but other finalists have interpreted traditional styles in more novel ways. Faig Ahmed’s handwoven carpets are based on classic abstract rug patterns, but for each work the artist has digitally designed a dramatic and unexpected intervention on the textile’s surface. In one of his pieces a part of the rug seems to have collapsed back into the wall; in another the classic pattern disintegrates into computer pixels. In Ahmed’s work, modernity seems to inflict damage on tradition, or cause its degradation. The tension between old and new is also a theme in some of the other finalists’ work. 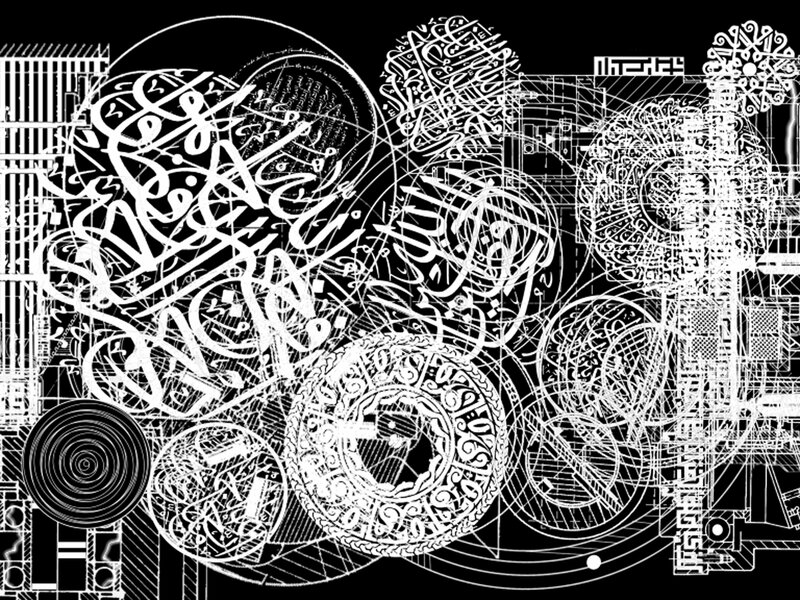 Mounir Fatmi’s digital video Modern Times: A History of the Machine, in which circles of Arabic calligraphy combine to create a violent, whirring, unstoppable machine, is the artist’s symbol of the sense of unease between convention and new ideas that gave birth to the Arab Spring. Florie Salnot’s Plastic Gold jewellery also addresses how tradition can adapt to harsh modern realities. The intricate, ‘gold’ necklaces Salnot creates are in fact made of finely cut plastic bottles and gold paint, a technique the designer developed while working alongside Western Saharan refugee women in Algeria. As part of an initiative by the Sandblast charity, Salnot helped the refugees to adapt their traditional jewellery-making skills to the scarce materials available in an attempt to give the women a means to voice themselves through art. The Jameel Prize 3 exhibition is full of unexpected interpretations of tradition and demonstrates the wealth of contemporary international creative practice that takes inspiration, to a greater or lesser degree, from classic Islamic styles and techniques. Jameel Prize 3 is open until 21 April.